Eve is a writer of Adult and YA fiction. She also loves tea (lots of it), 80s music and most things relating to The Beatles. 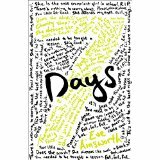 Seven Days is Eve’s Young Adult debut, published by Scholastic in 2015. The Blog of Maisy Malone is a adult comedy novel that has received pleasing reviews on Amazon. Eve has had short stories published in magazines such as Writers’ Forum and Prima. Find Eve on Twitter @EveAinsworth.